OnePlus 5 India launch event has started. The event is being held in Mumbai, and being live-streamed on YouTube, so you can catch all the updates as they are announced in the video below. For the Indian market, OnePlus 5 will come with Paytm integration on the software side, with a new Quick Pay feature that brings users to the payment page with a single long-press on he fingerprint sensor. The smartphone will be available to purchase today itself from Amazon India. In a contest being held at the launch event, the OnePlus 5 price in India has been announced as Rs. 32,999 for the 6GB RAM + 64GB storage variant, and Rs. 37,999 for the 8GB RM + 128GB storage variant. OnePlus 5 will become available to buy from Amazon India at 4:30pm IST on Thursday itself. The company is also hosting pop-up events in New Delhi, Mumbai, Bengaluru and Chennai over the next couple of days, where the smartphone will be available for purchase offline. OnePlus 5 runs OxygenOS based on Android 7.1.1 Nougat. It is a dual-SIM dual-standby smartphone with support for Nano-SIM cards. It sports a 5.5-inch full-HD (1080×1920 pixels) Optic AMOLED display supporting sRGB and DCI-P3 colour standards, and is protected by 2.5D Gorilla Glass 5. The new flagship smartphone is powered by a Qualcomm Snapdragon 835 SoC coupled with the Adreno 540 GPU and up to 8GB of LPDDR4X RAM. 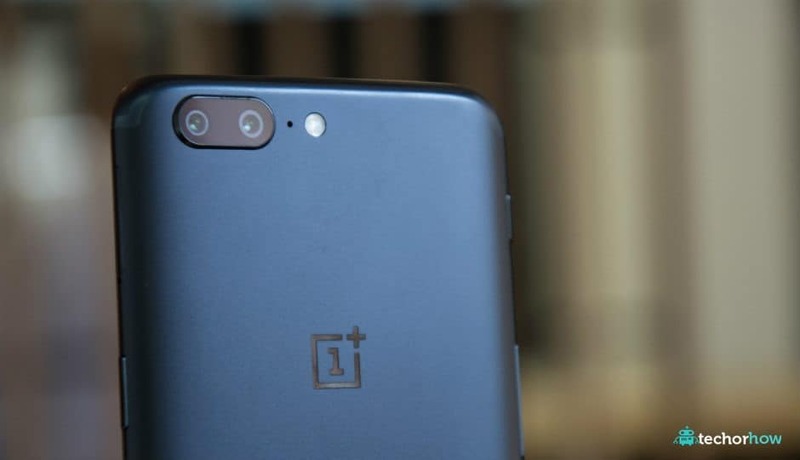 As for camera, OnePlus 5 bears a dual rear camera setup made up of a 16-megapixel main camera (Sony IMX398 sensor, 1.12-micron pixels) with an f/1.7 aperture and a 20-megapixel telephoto camera (Sony IMX350 sensor, 1-micron pixels) with an f/2.6 aperture. Coming to the front camera, buyers will get a 16-megapixel front camera with a 1-micron pixel Sony IMX371 sensor, an f/2.0 aperture, and EIS. OnePlus 5 connectivity options include 4G LTE (with VoLTE), dual-band Wi-Fi 802.11 a/b/g/n/ac, Bluetooth v5.0, NFC, GPS/ A-GPS, and USB Type-C (v2.0). Sensors on board the smartphone include an accelerometer, ambient light sensor, digital compass, gyroscope, and a proximity sensor. It weighs 153 grams, and measures 154.2×74.1×7.25mm. The new OnePlus 5 will be available in two colour variants – Midnight Black and Slate Grey. It retains the single speaker as well as the 3.5mm audio jack on the bottom panel. Other features carried on from previous generations of OnePlus smartphones include hardware capacitive keys (with the option of onscreen navigation) and the Alert Slider.